It was my son’s turn again to provide snacks for his class. The last time I baked these vegan brownies and vegan pumpkin cookies. This time I decided to bake rich cocoa crinkle cookies from Hershey’s Holiday Favorites. This is a small book with recipes for decadent cakes, cookies, brownies and more. I chose this recipe because it was simple to bake and also saw that the recipe yielded 6 and 1/2 dozen cookies and I need that much. I was not sure for one reason because it used 4 eggs and it would be the first time I will be replacing 4 eggs with an egg substitute and especially with Ener-G. Finally I decided to go with it and baked it. The crinkle cookies were real good. I was expecting a crisp cookie, but it was chewy. I think the quantity of sugar can be reduced. Since it was for the kids I made it small (2 bites size). I used approximately 1/2 tablespoon dough for each cookie and got exactly 100 cookies. My son liked the cookies. He usually narrates me everything that happens in class and from what he told I gathered that his friends liked it as well. 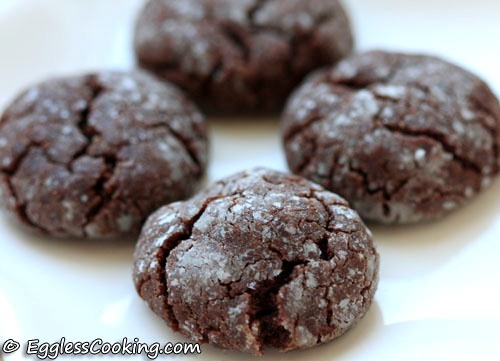 Go on a chocolate high with these easy to bake crinkle cookies without eggs. Using vegetable oil instead of butter makes it vegan too. If the quantity of oil scares you away try substituting some of it with unsweetened applesauce and enjoy a much softer and chewier cookies. In a mixing bowl, stir together flour, baking powder and salt. Keep it aside. In another large mixing bowl, beat together the oil and sugar. Then add the cocoa and beat once again until well blended. In a blender, blend together the EnerG powder and warm water for 2-3 minutes until it’s foamy. Add the EnerG mix and vanilla extract to the wet ingredients and beat it once again. Add the flour mixture gradually to the cocoa mixture, beating well. At this stage the cookie dough becomes very thick. My electric hand beater stopped working and I had to mix the dough with my hand. It had the consistency of stiff chapathi dough. Cover and refrigerate the dough for at least 6 hours. Preheat oven to 350F for 15 minutes. Prepare cookie sheets by greasing or lining with parchment paper. Shape the dough into balls (I used around 1/2 tablespoon of dough); roll in powdered sugar to coat. Place about 2 inches apart on prepared cookie sheets. Bake 10 to 12 minutes or until almost no indentation remains when touched lightly and tops are crackled. I baked mine for 11 minutes. Cool slightly. Remove from cookie sheet to wire rack and cool completely. The instructions in the EnerG pack suggests to use warm water while blending the powder. I didn’t do that in my earlier recipes but did this time and I think it foams up more while using warm water. Also the suggested ratio for the powder and water is 1 and 1/2 teaspoons and 2 tablespoons water. So it is 6 teaspoons powder and 8 tablespoons water in this recipe. I did the same first and while mixing the dough I found that it did not come together. It was crumbly. So I added 1 tablespoon water at a time to the dough and felt the texture was right after adding 4 tablespoons of water in total. I first test baked 2 cookies. When tasted I found that it was very sweet. So for the subsequent batches I rolled the cookies with very less powdered sugar. For the final batch, I rolled the shaped cookie dough in cocoa powder to balance the sweetness. With the first bite you can taste a very light bitterness but it gets sweeter and the cookies were a little sticky. The next time I bake it I’m going to try reducing 1/4 cup of sugar. 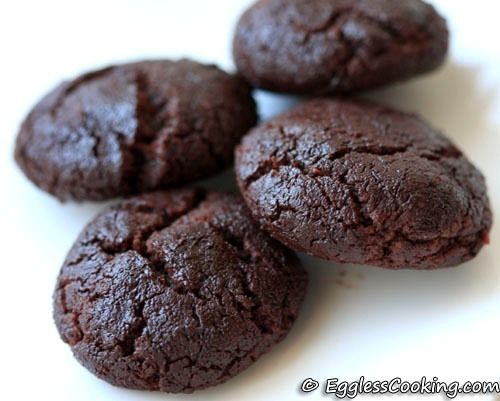 These vegan chocolate crinkle cookies goes to Egg Replacement Event – Egg Replacer Powder hosted by me. 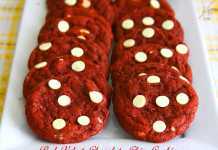 The Best Red Velvet Chocolate Chip Cookies Ever! Being that I am a strict (really strict) vegan, I do not eat enerG or oil or sugar. Can I use Avocado in place of the oil, and banana (or Applesauce) in place of the egg substitute? I will use Stevia and Arrowroot starch for the powdered sugar. Thanks! All these changes won’t give the exact taste and texture of the original recipe. 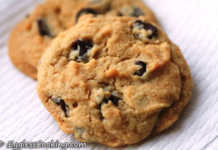 You might end up having soft, chewy cookie like end product. Would this work with a gluten free flour? I think it will Jennifer. Thanks Aakanksha. I guess it’s individual’s taste preference. If you like coconut and chocolate then go for it. Thanks for this awesome recipe! They turned out really well and were super easy to make. I used 1/2 the sugar and found them to be sweet enough for my liking (but I’m more of a cocoa fanatic than sugar). This totally hit the spot. I really love your website and after such a great success with this recipe I’m excited to try out more! You’re welcome Heather. I’m sure that you would like the other recipes too. I can’t think of anything other than EnerG and flax seed meal in this recipe Cara. Bananas wouldn’t suit this recipe. Maybe I would try about 1/2 cup of condensed milk and reduce the quantity of sugar to 1 and 1/2 cups. You could beat together the oil, condensed milk and sugar and proceed with the rest of the recipe. Can I substitute the EnerG with applesauce? Not in this recipe Vera. The cookies will turn out soft/chewy instead of crispy. You could try flaxseed meal instead. I have a question is there a way to make less of these cookies say around 25 ? Anna, I made them very small. So you can either increase the size of the cookies, or bake the100 and freeze some for later, or shape the dough into balls and freeze the unbaked dough or try halving the measurement. I’m not sure about the halving because sometimes halving a recipe does not work. Thank you so much for the cookie recipe, our daughter is allergic to eggs and we were desperately searching for a good cookie recipe. We made them Sunday and they are delicious, almost like a 2 bite brownie. It is the first time I have had anything I cooked turn out just like the photo. Thanks again. Wow! that’s great to know Paul. Happy Holidays. They look so good I am going to surprise my daughter with these for her birthday tomorrow. I hope she likes it. You’re welcome Divya. Birthday wishes to your daughter. Hi Shawn, that must be very difficult indeed. 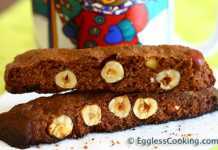 Try http://www.elanaspantry.com for gluten free baking recipes and use the egg substitutes I have listed here in her recipes. Also see if you can get Sinfully Vegan in your library/book store. If I remember right all the recipes (or at least most of them) in that book are gluten free as well as egg free. i have to say, this was my first experience with enerG and they came out pretty darn good. Reney, thanks for giving it a shot. I love crackle cookies. And vegan too. You’re so good. Thanks for sharing!